You know how you open a “project” in a local code editor? I guess different editors have different terminology for it, but essentially what you are doing is opening a folder/directory and it shows you a sidebar full of files and folders you can navigate through and such. Typically there is one parent folder, and everything else is within that folder. Right? Well, it doesn’t have to be! That’s where symbolic links come in. Otherwise known as symlinks, they are like pointers to another place. While you don’t have to actually move the folder you are referencing, you can create a pointer to it that behaves as if you did. You’ll get a link that looks like an “alias” on macOS. Ya know, the things you can make by right-clicking an item or going File > Make Alias. But they are different. In my experience, aliases tend not to work in code editors, but symlinks do. Looks like an alias, but it’s really a symlink. I was actually lazy (hey, I prefer GUIs for just about everything) and used Nick Zitzmann’s symboliclinker context menu plugin to help make the link I wanted (and allow me to make other ones super easy). 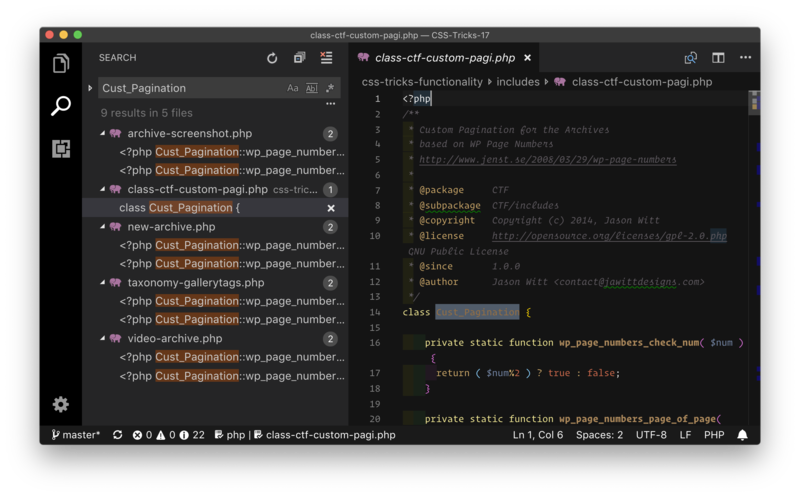 I know that some editors have their own concept of this, like VS Code’s Multi-root Workspaces and how you can Project > Add Folder to Project in Sublime. But symlinks are a way to do the same thing but in a cross-editor and cross-system way that everyone can use!